The Frugal Family Life: *HOT* $.50/1 Martha White Muffin Mix = Possibly FREE? *HOT* $.50/1 Martha White Muffin Mix = Possibly FREE? Here's another *HOT* coupon!! 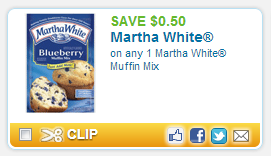 Print this $.50/1 Martha White Muffin Mix coupon! This one will double to $1 off of ONE! I'm thinking these are only priced about $1 anyway--meaning FREE or very close to it!! Use zipcode 97401 to find it quickly and you may need to use Internet Explorer or Google Chrome for it to show up.